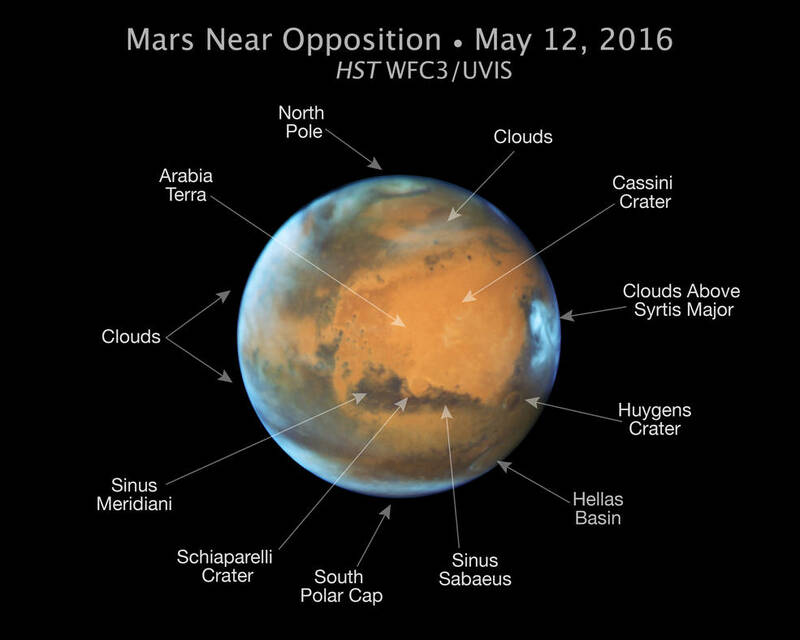 May 19, 2016 – Bright, frosty polar caps, and clouds above a vivid, rust-colored landscape reveal Mars as a dynamic seasonal planet in this NASA Hubble Space Telescope view taken on May 12, 2016, when Mars was 50 million miles from Earth. The Hubble image reveals details as small as 20 to 30 miles across. The large, dark region at far right is Syrtis Major Planitia, one of the first features identified on the surface of the planet by seventeenth-century observers. Christiaan Huygens used this feature to measure the rotation rate of Mars. (A Martian day is about 24 hours and 37 minutes.) Today we know that Syrtis Major is an ancient, inactive shield volcano. Late-afternoon clouds surround its summit in this view. An extended blanket of clouds can be seen over the southern polar cap. The icy northern polar cap has receded to a comparatively small size because it is now late summer in the northern hemisphere. Hubble photographed a wispy afternoon lateral cloud extending for at least 1,000 miles at mid-northern latitudes. Early morning clouds and haze extend along the western limb. The biennial close approaches between Mars and Earth are not all the same. Mars’ orbit around the sun is markedly elliptical; the close approaches to Earth can range from 35 million to 63 million miles. They occur because about every two years Earth’s orbit catches up to Mars’ orbit, aligning the sun, Earth, and Mars in a straight line, so that Mars and the sun are on “opposing” sides of Earth. This phenomenon is a result of the difference in orbital periods between Earth’s orbit and Mars’ orbit. While Earth takes the familiar 365 days to travel once around the sun, Mars takes 687 Earth days to make its trip around our star. 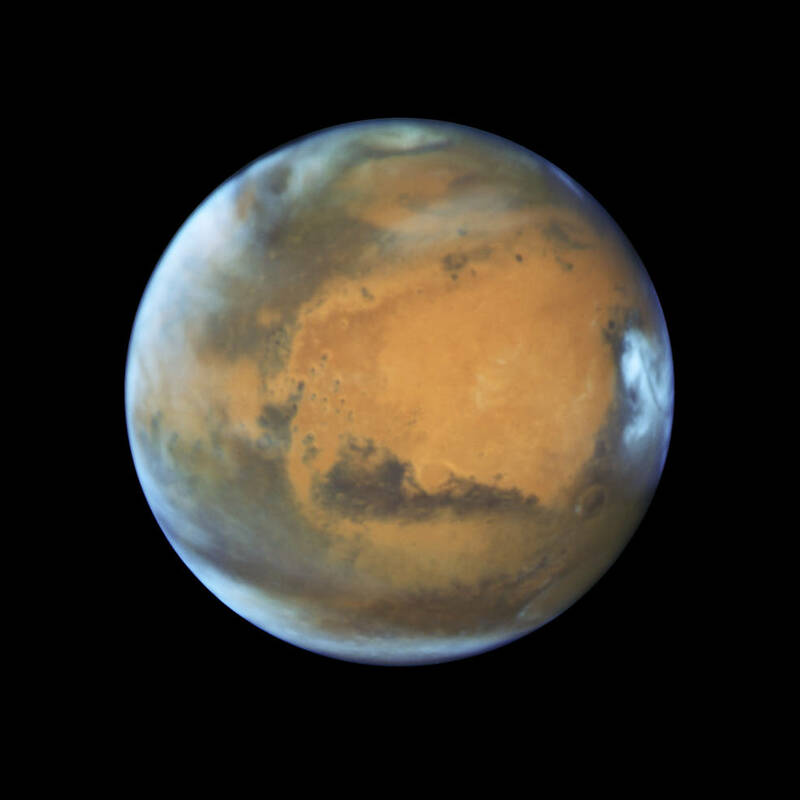 As a result, Earth makes almost two full orbits in the time it takes Mars to make just one, resulting in the occurrence of Martian oppositions about every 26 months.